Originally published November 1, 2008 this has been one of the all time post popular posts on TDZ. It actually started out as kind of a joke with The Big Guy and I discussing unusual team mascots. 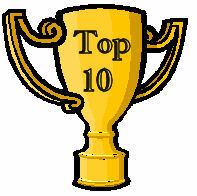 Well, it has been awhile since I posted a top 10 because I just couldn’t come up with one I liked. The Big Guy was watching football the other day when I got an inspiration for another Top 10. The Big Guy liked the idea and even suggested a few teams. #10 Hamlin (TX) Pied Pipers: For a town named Hamlin I guess this one is an obvious choice. The piper in the logo looks pretty fierce nothing like the one from the story books. #9 Sidney Lanier (AL) Poets: After Googling, Sidney Lanier I discovered that he was an American poet and musician who lived in the 1800’s. While Poet seems like a strange choice for a sports team mascot it is appropriate for the school’s name. #8 Itasca (TX) Wampus Cats: We used to play Itasca when I was in high school. My favorite cheer when we played them was “Here Kitty, Here Kitty, Wamp Wamp (Clap hands together)”. I really did not know what a Wampus Cat was, so I decided to do some research. Found out that according to Cheerokee legend a Wampus Cat is a mythical cat with six legs, four used for running and two for fighting. #7 John Marshall (CA) Barristers: The school’s mascot does make sense because John Marshall served as Chief justice of the U.S. Supreme Court from 1801-1835. The idea of a lawyer as a team mascot is amusing. What do they do, sue their opponents? #7 John Marshall (OH) Lawyers: Ok, #7 is a tie. #6 St. Hubert (PA) Bambies: Yes, that is right Bambie. St. Hubert’s is a Catholic Girl’s High School. #5 New Braunfels (TX) Unicorns: Not only does New Braunfels have the best waterpark in the U.S. the high school has a very unique mascot. #4 New Berlin (IL) Jr./Sr. High School Pretzels: Not particularly a mascot that strikes fear the heart of opponents, it does make me hungry. According to their website only two schools in the U.S. have Pretzels as a mascot. #3 West Plains (MO) Zizzers: I don’t exactly know what a Zizzer is but they do have a cool logo. #2 Danville (AR) Little Johns: I found the story behind Danville’s mascot rather interesting. When French Explorer Jean Chavet left France to scout the Mississippi and Arkansas rivers he left behind his girlfriend Adrienne Dumonde. In desperation she followed him to the docks and pursued the cabin boy to let her take his place. The other crew members called her Petit Jean because of her small size. According to legend she for three years no one discovered her true identity. Her identity was not discovered until she became sic and was left with a local tribe. Petit Jean river and mountain are named in her honor. #1 Ojai Valley School (CA) Spuds: A potato may be not only the strangest school mascot I’ve heard of but one of the least threatening.